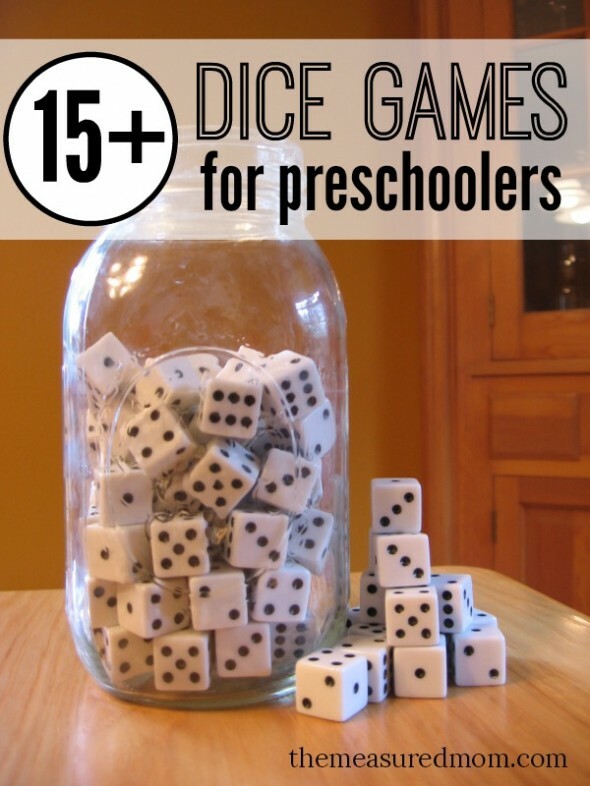 Today I’m sharing a big collection of dice games for preschoolers! We love dice around here. We love them so much that they’re always disappearing! This week I bought a set of 100 dice and stored them in glass canning jar so we’d always have access to them. 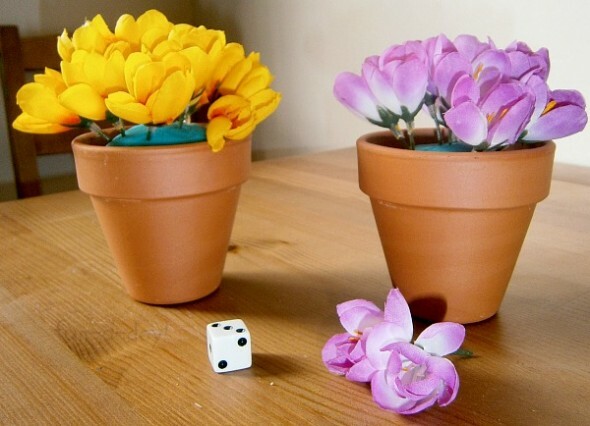 Roll & Cover games are a popular way to learn with dice. 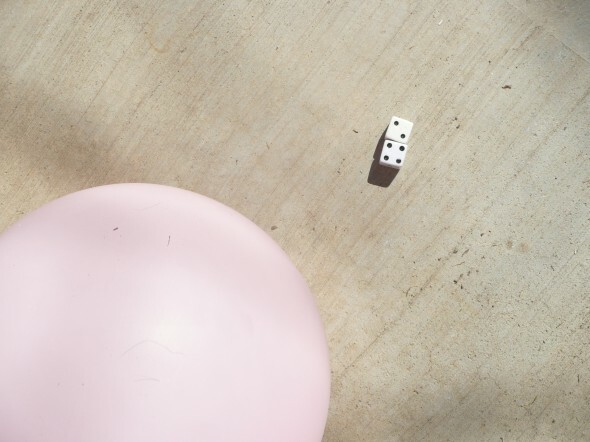 The simplest version involves rolling a die and covering the number that you rolled. In my post you’ll find ten seasonal and holiday games. 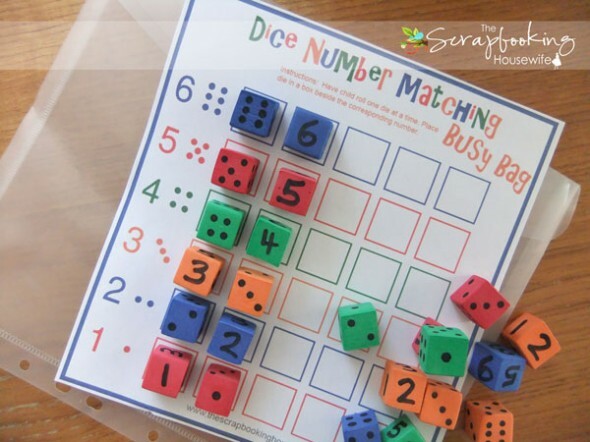 You’ll find a set using one die (pictured) and a set using two dice; older preschoolers might be ready to add the two numbers together and cover their sum. 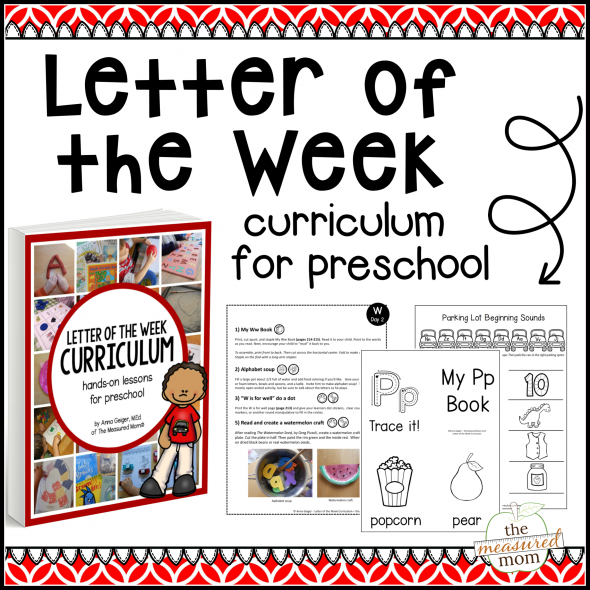 Get the free printables in this post. You’ve played the card game War, right? If you have a big set of dice, you can play a similar game. Even if you don’t buy a big set like we did, you can gather dice from your board game collection to play this one. Just put all the dice in a big pile. Each of you takes a die and rolls it. Whoever has the higher number gets both dice. If you roll the same number. those dice stay in the middle and you both roll again. Whoever gets the highest number takes all four dice. At the end of the game, each of you counts your dice to see who has the most. This is a great game for learning to compare numbers! 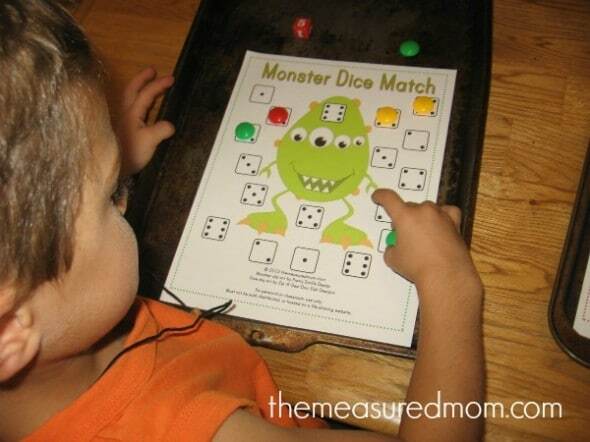 For the simple version of this game, your child can match dotted dice to the pictures. 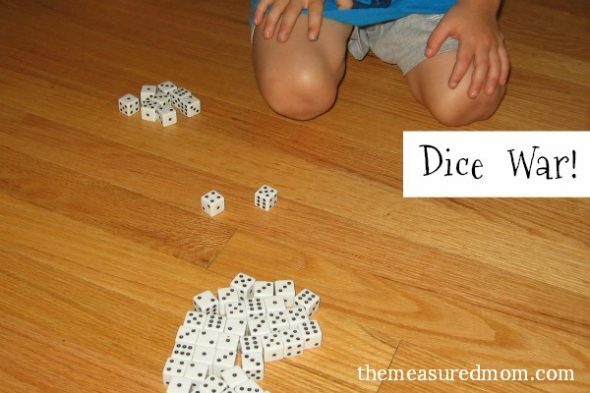 This is a great introduction to using dice for older toddlers and young preschoolers. If you have a numbered die, your child can cover the die which shows the same number. Get your free printable board games in this post. 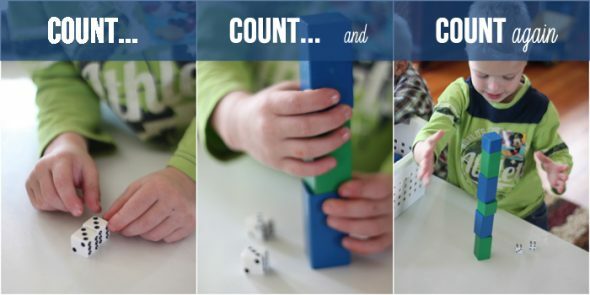 Visit Hands on As We Grow to see how to count and build with dice. Gather a collection of dice and get this gorgeous free printable for a dice matching busy bag over at The Scrapbooking Housewife. 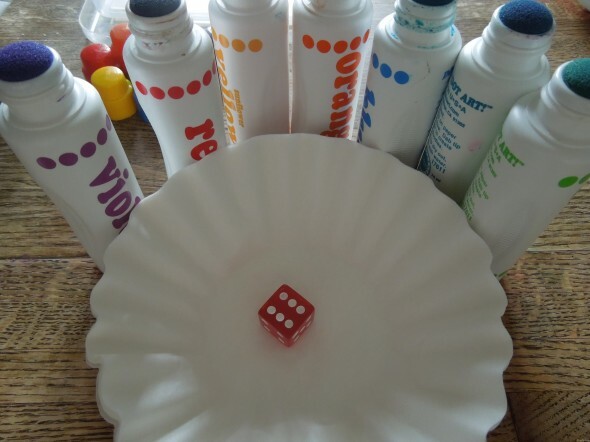 This active dice dot pattern game from This Reading Mama is perfect for a rainy day! It will have your child learning and exercising at the same time. Love! 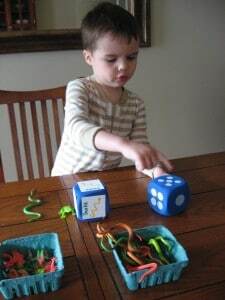 Looking for another dice game to get your child moving? Play this balloon game from Confidence Meets Parenting. My kids had to wear warm jackets to school this week – can you believe it? 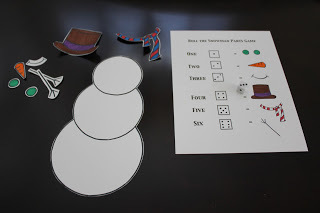 We’ll be playing this build-a-snowman game from Toddler Approved soon enough! 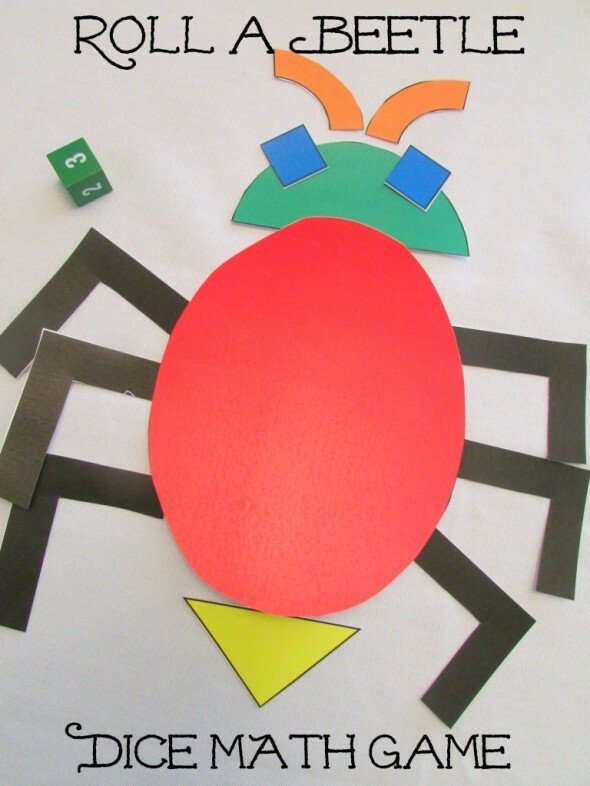 Get the free printable and directions for this fun Roll a Beetle game from Teach Beside Me. Love this dice bingo game! Hop on over to Lessons Learnt Journal to learn how to play it. Isn’t this a creative way to use up old lids? 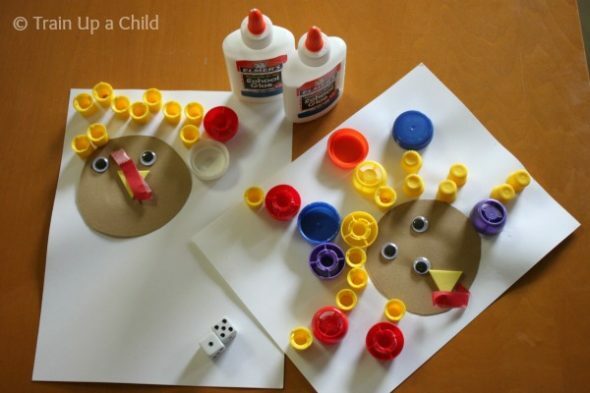 Check out this turkey dice game from Learn Play Imagine. Get out some fun rubber animals and play this preschool counting game from No Time for Flashcards. Doesn’t this look inviting? 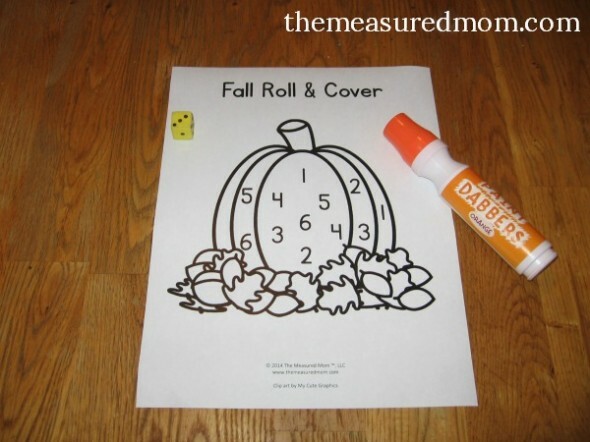 You’ll need some coffee filters, Do-a-Dot markers, and the directions for this simple math game at Play Dr. Mom. 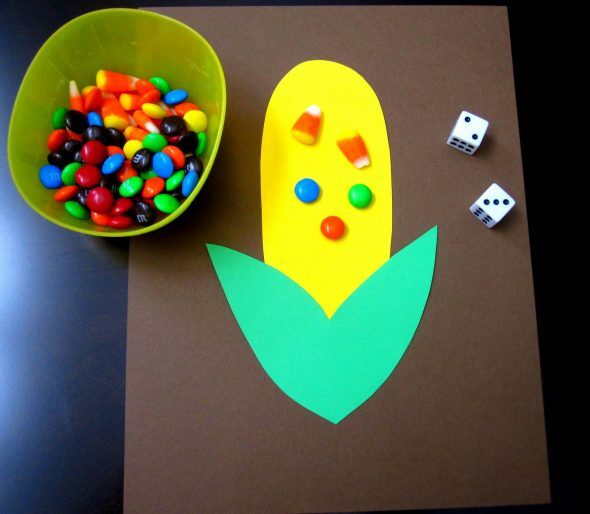 Check out this candy with dice game from Toddler Approved. It’s a great way to use extra holiday candy! If you want to keep candy out of your house, try using pom poms, glass gems, or other fun manipulatives. Will definitely try some of these ideas in my classroom. Thanks, Lauren – I hope your students enjoy them! Wow! What great ideas! Thanks for including my dot dabber dice game! Thanks Anna for those wonderful dice game such a wonderful ideas . 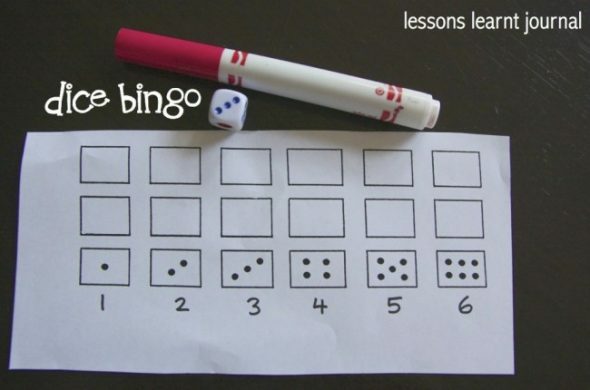 I’m using the dice bingo, roll and count , and candy dice game for my level 1 students. Loved this ideas, will definitely try with my 3 year-old!! Thanks for sharing!! Pinning! We have plenty of dice, but I have yet to use them…lol. Thanks for the pin, Selena! So many great and fun ideas for learning! Thank you for sharing your “A”mazing ideas. 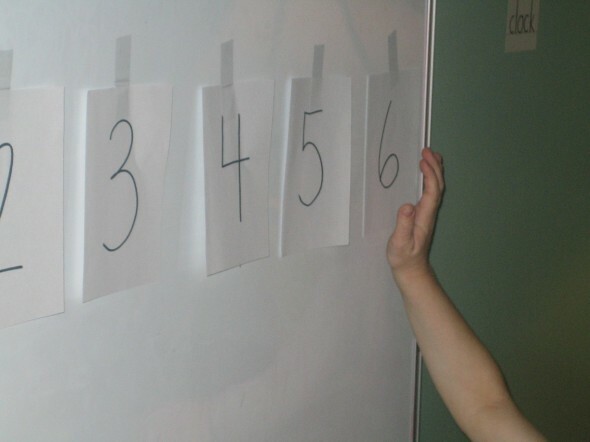 I love the variety of ideas you have for math and yours are just what I have been looking for! I look forward to using them with my kiddos. You’re very welcome, Dianne – I hope you enjoy them! Have you ever checked out D&D dice? As well as the standard six-sided dice, D&D uses 4-sided, 8-sided, 10-sided, 12-sided and 20-sided dice. I’ve always thought D&D dice would be good for teaching math. I had not heard of that, Ettina. I just looked on Amazon and there’s a pretty awesome set. Thanks for the suggestion! Just bought a five piece wooden lawn dice set from Hobby Lobby for four year old granddaughter who loves dice. I’m getting an Easter gift ready for her with loads of items to use with her dice, and I found you online! I absolutely love love love your site and ideas! Thank you so much, we are going to have a fun summer outdoors with your exceptionally creative ideas. Thanks very much for FREE quality of printable worksheets and sharing great activities ideas. Thank you so much for sharing. I am a Math Coach in a K-2 school. We host a school tour day for our local preschools. I am going to let our Kindergartners play this game with the preschoolers.